It’s time for one of my favorite posts of the year! You know I love food and all, but I really love games. For the last couple of years, I’ve posted a mini game gift guide for the holidays, and believe it or not, with all the games already crowding our game closet, I have a few more recommendations for you this year, too! Seriously, the suggestions below may be some of my favorite games ever! I’ve given notes in italics about our experience playing each game as a family (what works, what doesn’t, best ages to play, etc). Also, be sure to check out the end of the post for my top favorites from the last five years (a Best Of section!) and links to past gift guides. Just a reminder that nothing in this post (or any of my gift guides) is sponsored. These really, truly are the games we’ve bought (or been gifted) and loved…and played and played and played. Disclaimer: the gift guide below contains some affiliate links to Amazon where I’ve bought the games from; as always, feel free to shop around! Here we go! Favorite games of 2017. 1. Tapple. Such a fun, fun group game! We took this game to my parent’s house this summer and played it over and over, and it’s played often at home, too. I love games the whole family can play, and I particularly love word games (like this top favorite Word on the Street game)! Everyone ages 5 and up plays this game – we give the two youngest kids more “strikes” before they are out. 2. Qbitz. I think this is Cam’s favorite game…she wants to play it every single night (which doesn’t happen, by the way, much to her dismay). She’s surprisingly good considering she’s five and this is for older kids/adults (Qbitz Jr seems too elementary, so I haven’t bought that version). I love how this game challenges all of our brains as we try to figure out and recreate the pattern (spoiler alert: I’m surprisingly bad, but I LOVE playing it). Everyone plays but we go deliberately slow when Cam is playing; it’s more competitive when everyone is ages 10 and up. 3. 6 Nimmt. My cousin, Camille, texted me and told me this was her new favorite game, and I needed to get it ASAP. She’s right! We love this game so much, and it would definitely be in my top favorite games for this year. I love that it can be played with anywhere from 2-10 players, it’s fast-paced, easy to learn, different EVERY round, and honestly, so much fun. Card games for the win. Cam (5-year old) is usually on someone’s team, otherwise everyone ages 8 and up can play on their own – again this goes faster and is more competitive with teens/adults, but it’s playable by a range of ages. 4. Bold. Another card game we love so much! We take this one a lot of places to play while we wait for other kids to finish up activities. It requires a little space to play (a grid of 4X5 cards) but it’s easy to learn and addicting! Can’t…stop…playing. Another game that is great for ages 5 and up – sometimes we have to help Cam identify what makes a match, but other than that, she usually smokes us. 5. Flimsee. Undoubtedly, this is one of our favorite outdoor games of all time. My friend, Lindsay, told me about it this summer, and we literally played it every day, took it on all of our road trips, and introduced many, many friends to it (my brother and dad and several friends all bought a set AND my dad made me cool stands for it, as well). It can literally be played anywhere and by someone with zero athletic ability (ahem, me)! A game for all ages, it’s obviously more competitive when it’s teenagers and adults, but we play it as a family a lot, and we let the younger kids take a few steps forward. 6. Spontuneous. I was surprised how much we love this game! And, I have to be honest, I was quite shocked at how many songs Brian knows (super random ones that I make him look up on his phone before I believe him: like, I Hired a Wino to Decorate My Home). This is a hilarious game that’s great for all ages/players (you don’t have to be a singer, trust me!). We all play this as long as we split up into teams that are fair with a variety of ages. 7. El Dorado. My brother highly recommended this game to us, and I can see why! I love almost every Ravensburger game I’ve ever played; this one is a cool strategy exploration game that reminds me of a mashup of Settlers, Carcassone, and other similar tile/exploring games like that. This is definitely a game more suited to ages 10 and up – and it is really fun to play with all adults or older teens. 8. Kan Jam. Another seriously fun outdoor game, I bought this for my dad, and it is crazy how such a simple game can occupy obsessive, competitive children and adults for hours and hours and hours. Like Flimsee, all ages can play this – we give the smaller kids a step forward advantage. 9. Djubi. Jackson got this for his birthday (and actually so did Walker from his aunt and uncle); I don’t think my boys will ever get sick of games that have a variation on playing catch. They play this in our messy bonus room and outside. Great for all ages with modifications, but the most fun for kids and adults that can catch a ball easily (haha, not me). I bought Sleeping Queens when you first recommended it… and then it sat, unopened, in the game closet. We *finally* opened it last weekend, and are obsessed! SO FUN for all ages, from my 8-year-old to my 70-year-old MIL. Thanks for your thoughtful recommendations! Glad you finally opened it…and loved it!! I have to chime in here– I had my eye on Battle of the UFOs when you posted about it originally, but wasn’t able to get one before they were all sold out. It is the type of game I know the whole family will love, so I didn’t give up and I snagged one this year. One note, though– I just got the confirmation email and invoice from the creators. I can only assume that part of the issue is me living on the east coast, but shipping is $30!! With a $55 game, $30 shipping, and $5 handling fee, the total price ends up nearly double the list price. I guess I should have asked them for a shipping quote beforehand, oops. But I wanted to let others know who may be thinking about the game. 🙂 Hope it’s worth $90!! Saved again, by your list! Thanks so much! Every game I have ever bought per your recommendation has been so fun! In fact, labyrinth will be under the tree this year. Thanks for keeping me updated on the best games around. And by the way, this is the first time I have posted but I have made countless recipes of yours and I am never disappointed. Thanks for all of your hard work! I love this list every year! It’s like early Christmas when you put this out!! I have been waiting for this post! Seriously like checking everyday! All games we have bought based upon your Recs have been a huge success! I did a little happy squeal when I saw your annual gift guide post was up! It is my most favorite post of the year, which says a lot considering how much I adore ALL of your posts and recipes! You make gift giving so simple with your never fail game/toy suggestions. Thanks for taking some of the stress out of the holiday season. You did not disappoint again this year, and my family will thank you come Christmas morning! Thanks so much, Paige! I have a pretty fun kid gift guide coming next week (plus a few other). So happy to know they are worthwhile for you! Thank you for the game suggestions. This is the 3rd year that I have gifted my grandkids from your game lists. They have all been really big hits. Thank you! Just made your apple crumb pie for dinner at church tomorrow. Looks yummy! We’ve been playing Ticket to Ride for several years. One of my personal favorites. Thanks for the great ideas! Our favorites are splendor, qwirkle, and I’ve heard about and am excited to try out machi kora and kingdomino. We love splendor and qwirkle, too – I’ll have to check out those other two. Haven’t heard of them! I have tried and loved many of your recipes so thank you for all of he inspiration! My husband and I love to play games but it is usually just the two of us. Are there one or two strategy games you like best for two players? Carcasonne is our absolute favorite and we also enjoy settlers of Catan when we have a group. Thank you so much for all that you do for your readers!! I am making your crock pot turkey breast as my first turkey next week for Thanksgiving. I think you would really like the El Dorado game – and it can be played with 2 players. You might also like Jaipur and Lost Cities – two other favorite games that can be two player games. We took your recommendation and have started playing El Dorado and we love it! Thank you for the thoughtful reply. I look forward to trying Jaipur and Lost Cities next! Hey Natalie – the $50 version is the old version and the $18 version is the remake. The rules and object of the game are completely the same. I have the old, red box version, but from what I’ve seen and read, I don’t think it necessitates the extra cost – the remake is the same with different artwork. Hope that helps! Thank you! Love these gift guides. I’ve used your recommendations the last couple years. My kids love doodle quest, fast track, busy town. I haven’t quite figured out how to play Ticket to Ride though and that was from last Christmas. Those are all some of our favorites, too! Bummer about Ticket to Ride – what ages are usually playing it with you? I have been anxiously waiting for your gift guides to show up! Thanks so much for doing these! I absolutely love you! You have flawless taste in gifts and recipes. You are so sweet…thanks, Brooke! If you have time, check out our favorite family holiday activity that my husband has been working to take a step further: Chime-e-okie. (Chime-e-okie.com and the YouTube by the same name). 6 Nimmt is also called “take 6”. We pull it out now and then. And I echo others on Sleeping Queens – I’ve never met a kid who didn’t like it. Love to read your go-to favorites, Holly! Thank you for this! I love your recipes, but I look forward to this post every year, and I refer back to it multiple times throughout the year. You are not only my recipe go-to person, you are my game go-to person as well. Thank you, thank you!!! We have several of these as well but I’m glad for more recommendations from you, dear friend! Do you have Lunacy? It’s a super easy game and we’ve introduced it to many friends who in turn go out and buy it. My grandkids LOVE Bold! Monster Maker is another great one I bet your kids would love. Thanks for the great post. Happy Thanksgiving to you and your family, Mel! I don’t have those games, Sally! Excited to check them out. Thank you! Hope you love the games, Kim! You continue to be a wealth of good information! Thank you so much for sharing. Your recipes and gift guides are my go-to. Happy holidays! We had the new stuffed shells recipe last night. My husband said it was restaurant quality! 2/3 of the kids had seconds! Definitely going in our rotation! Thanks so much for making dinner enjoyable! Thanks for all you do! You are so sweet – thanks, Christy!! I love these game guides! Have you ever played the game Donkey? It is one of our favorites! Thanks for the recommendation, Ali! I love your game guides! I read them every year. Ah Mel I was just wishing for a new gift guide from you! We always purchase several of your recommendations for Christmas. Love your toy gift guides, too. Thanks so much for compiling this list!! My sister introduced us to Smallworld recently, we love it! Even my hubs who tends to be grumpy about learning new games was instantly wanting to go buy it! Have you played it? It’s kind of a shorter and more varied version of risk. My 9 year old was able to play it with us. I thought we would have to help him quite a bit, but only had to help him understand the “special powers” then he went with it and beat us all! Our younger 3 just liked looking at the characters while we played, our 6 year old just liked to point out the immodesty of some of the characters, glad she recognized that, ha! I look forward to this EVERY year – thank you for putting this together!! Your gift guides are my favourite! Can’t wait to look through these with my hubby later! Thank you! I always love getting games for the kids at Christmas. I always look forward to this post and your gift giving post every year. Such fun ideas. Is there one particular one that you would recommend to a 19yr old who has high functioning autism? Thanks so much! Hi Tammy – the two that come to mind are Qbitz and 6 Nimmt! This looks SO fun! We almost never play games… What suggestions would you give to a family just starting out? (We own a few games- it’s the playing them part we have trouble with). Thanks, Mel! Hey Amy – are you talking about suggestions for actually playing them? We have a game closet jam packed with games, but I always choose a few and keep them near my planner in the kitchen so they are in eyesight. Then, when we have a few minutes or a slower evening, they are right there to grab and start playing! Thank you, thank you! You’ve got my brain going on this one. I’m sure we’ll be able to figure it out. Consistency is key, right? Thanks again, Mel! Sure do love you! At our house our kids can have a hard time playing games too. We’ve been doing “Special Time” for each kid once a week. So one kid gets to stay up for 15 minutes with mom or dad and play a game while the other two kids go up to bed. This time is more about alone time with a parent but the kids always choose to play a game and they love this time together. We ordered battle of the ufo’s for my parents last year and it’s been such a big hit! My mom has taken it to grandkids all over the country and it is loved by all! Buying another one this year! Thanks for the recommendations. I love your game guides! We are about to move to a very cold place with very long winters–so, like you, even though our game shelf is filled, I’m all about more games! I just got Battle of the UFOs for my family (and my brother’s family) for Christmas! I tried in years past and couldn’t ever get one in time–but this year, I remembered early. They had them in stock and shipped them out right away. Oh, that’s awesome about the UFO’s game! I’m glad you got one! They sell out so fast every year. As many of your recipes as I use–this is always my favorite post of the year. In fact, I think we’ve gotten a game from your list for my son every Christmas since I started following this site. That makes me happy, Sarah! I love knowing the gift guides are helpful. Hopefully some of the games on this list will work for your son this year, too! Thank you! I love this post every year (and all of your other gift guides!). I’ll be getting several of these games. The Flimsee game made me laugh. We have been playing this for years and we call it Sticks & Cups. We use green stakes from Home Depot and Solo Cups with frisbees. Very cheap to put together. :-). We may have also been known to make the game a bit more difficult for the adults by requiring that they have a cold beverage in one hand. :-). Haha, I love the “sticks and cups” version. Sounds like a GREAT alternative to buying a set! It’s seriously so fun. Have you played “Really Bad Art?” We got it last year for Christmas, and it quickly became a favorite for group settings. You get a phrase like “the next best thing,” then have like 6 seconds to draw something that will help others match your picture to that phrase. You get points for guessing others correctly and for all who guess yours correctly. Because you only have 6 seconds to draw, it’s really bad art. And it puts everyone on an equal playing level, so even those who are good artists naturally have no advantage. Woo hoo! This is a post I look forward to every year! Your taste in food and fun games is amazing! Thanks so much for sharing. Heading to Amazon now! I hope you find one (or more??) 🙂 that you like, Kim! I have a problem with games…I love them so much! Thank you! I have been waiting on this to finish my Christmas shopping. I just needed a game for the family, so now I am good! Thanks for helping with both dinner and Christmas. You really are a rock Star!! Yay! I’ve been waiting for this post. Thank you Mel! I always love your suggestions. Yessssss!!!!!! 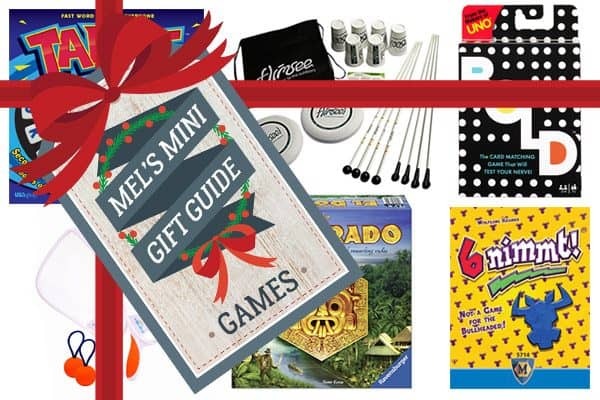 My favorite time of year…Mel’s gift guides! Thank you so much!